The RP-30FCH oil filter crusher applies 13,608 kg. of crushing force against used oil filters that need to be completely drained of residual oil. Its manual stainless steel handle is ergonomically placed on the side of the crusher to safely manage its two-way stop-and-start operation. 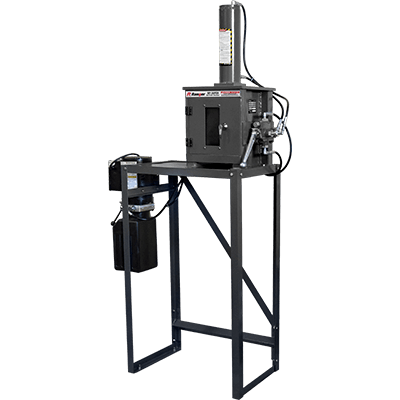 Did you know an oil filter crusher can help reduce shop costs and earn you profit? To maximise its money-making potential, we kept the RP-30FCH oil filter crusher simple, efficient and extremely powerful. As anyone who runs a quick-lube or full-service auto shop knows, the residual oil that gets stuck in oil filters is like liquid gold. Smart shops don’t let this stuff go, or else they have a plan to use it wisely for a profit. Used oil can be repurposed, recycled or re-refined, eliminating disposal fees and increasing your bottom line. Even the oil filter casings can be recycled as scrap metal. Not to mention, it’s illegal to dispose of oily, uncrushed filters without incurring heavy fines from both state and federal governments. With 15-Ton (13.6-mt.) of crushing power at your disposal, most oil filters can be easily smashed down to hockey pucks in a matter of seconds. As long as the uncrushed filter fits in the crushing chamber, there’s an extremely high likelihood this oil filter crusher will be draining out that oil in no time, converting your hazardous-waste oil filters into legally recyclable metal. The RP-30FCH crushes oil filters down to 20% of their original size and removes 95% of any remaining oil from the filter. A large, rugged stand permits the use of oil storage drums up to 208-L.
No bells and whistles here—just the essentials. Manually operated machinery is often preferred for its simplicity and overall dependability. The two-way handle permits lowering and raising of the crushing block; releasing the handle immediately stops all operations. To further ensure user safety, a built in, spring-loaded shutoff switch is depressed when the chamber door is closed. If the door opens for any reason, the switch cuts electrical connectivity to the crusher and operations instantly cease. Plus, the RP-30FCH oil filter crusher features a see-through fibreglass window, so operators get to safely watch all crushing operations in real-time. Maximum crushing pressure of 13,606-kg.